Hello Eyes On The Ring faithful, Nathan here once again with another weekly dose of Ring Of Honor Wrestling in form of my weekly ROH TV review. This show featured a handful of matches and some steady storyline progression towards ROH Best In The World, which is the next PPV. The show opens with a recap of last week when Colby Corino was announced as the Decade's new young boy. This entire thing will most likely lead to a match between BJ Whitmer and Steve Corino, and the best thing about this entire thing is that I can't tell whether or not they legit hate each other or if it's all part of the storyline. That is great wrestling right there. From there, we head inside of the arena where Kevin Kelly and Steve Corino are at the announcers desk to welcome us to the show. They rundown what we will be seeing in the hour before sending us to the ring for our first match of the night. Thoughts: The match starts and the two feel each other out for the first few minutes. Elgin gains the first advantage after he delivers a pump kick to the face of Ferrara as Ferrara is coming towards Elgin off of the ropes. From there, Elgin covers Ferrara for a 2 count as Ferrara kicks out and recovers long enough to deliver a code red, which gives Ferrara a near fall of his own. Elgin, who is dazed but not confused recovers and goes back on offense and hits a flurry of offense before delivering a buckle bomb followed by an Elgin bomb in the center of the ring to pick up the win via pinfall. Result: Michael Elgin defeats Will Ferrara via pinfall after an Elgin Bomb. After the match Elgin decides to add more punishment to the already fallen Ferrara by delivering another powerbomb. This match could have been way better and I wish I could have written a bit more about it, but the crowd was dead and the match itself wasn't very good. I don't know what it is with Elgin's character, but ever since the company has decided to take his character in this direction, his matches have suffered as a result. Not to mention that the character is annoying and not in a good way at all. From here, we go into our next match of the night. Thoughts: The match starts and Hanson almost immediately hits his patented Cartwheel closeline and tags in Rowe afterwards. Rowe, who is in his first match back since his motorcycle accident, makes his way into the ring. From there, Rowe picks up one of the jobbers in a back suplex position as Hanson comes off of the top rope with a leg drop and Rowe falls to the mat at the same time Hanson hits the leg drop. Rowe makes the pin and they pick up their first win as a tag team since Rowe made his return. Match Rating: N/A (Match was too short to rate and I'm not going to give it the 1 star treatment. Good showing from War Machine, this match did exactly what it needed to do which is reminded us that War Machine is a force to be reckoned with within the tag team ranks of ROH. From here, Michael Elgin makes his way back out to the ring and grabs a microphone. He says that he is here to punish ROH and this leads to an impromptu handicap match as Michael Elgin takes on War Machine. Thoughts: The match starts and Rowe who is in the ring, dropkicks Elgin, which sends Elgin flying into the corner. Hanson comes into the ring and runs at Elgin and does a single broncobuster landing on Elgin's chest. Elgin rolls out to the ring and grabs a chair, Hanson follows Elgin out and Elgin hits Hanson in the back with the chair, which causes a disqualification. Match Result: War Machine defeats Michael Elgin via DQ via chair shot to the back of Hanson by Elgin. From here we go into our fourth match of the night. Thoughts: The match starts and the two spend the first few minutes getting a feel for each other. ACH gets the advantage but QT rolls to the outside of the ring in order to stop ACH's wave of momentum. ACH, who is growing frustrated by QT's antics, makes his way out onto the ring apron and dives on to QT. QT catches ACH in midair and delivers a powerslam on the outside of the ring. QT rolls ACH back into the ring and delivers a tilt-a-whirl backbreaker, which gets a near fall. While ACH is trying to recover, QT climbs to the top rope and goes for a 450 Splash. QT misses the 450-splash attempt and hits the mat hard. While QT is trying to recover, ACH makes his way to the top rope and delivers a 450 splash of his own to score the pinfall victory over QT Marshall. Match Result: ACH defeats QT Marshall via pinfall after a 450 splash. From here, the Decade makes their way out to the ring, BJ Whitmer grabs a microphone and begins talking to ACH. This distracts ACH long enough for the Decade to attack. The entire thing ends when Adam Page hits ACH with his Belly to back piledriver. From here, we go to the main event of the evening, which is also the fifth match in the hour. Thoughts: The match starts and there is a lot of groundwork early on from both men. The two exchange their best holds while trying to gain the upper hand and get the best of each other in the process. The two make it to their feet, but AJ sends it right back to the ground as he delivers an armdrag to Briscoe and holds onto it by turning it into an armbar. Mark rolls out of the ring in order to shake off the damage and recover but Styles follows him out onto the floor. The action continues when Mark hits a dropkick to the outside. Mark then picks up the fallen AJ and brings him over to the barricade, but AJ recovers and picks Mark up and slams him back first on the top of the guardrail. Back in the ring and AJ locks in the calf killer, but Mark makes his way to the ropes in order to force the referee to break the hold. The two men reset and Mark takes Styles' head off with a lariat. Briscoe picks up Styles and hits a fisherman buster for a near fall. AJ recovers and gets the upper hand once again by hitting a flipping DDT to pick up a near fall of his own. The two both make it to their feet and run at each other as fast as they can and both deliver a clothesline, which causes both men to be laid out on the mat. AJ rolls out of the ring onto the apron and Mark, who by this point in the match has made it back up to his feet, dropkicks Styles off of the apron onto the floor. Mark makes his way onto the apron and dives out of the ring onto a fallen Styles with an elbow drop. Back in the ring, after both men reset, AJ gets the upper hand and hits the Bloody Sunday, then he follows it up with a Styles clash to score the victory via pinfall. From there, both AJ Styles and Mark Briscoe make it to their feet. They shake hands as the show draws to a close for the week. I don't know what it was about this show, it was good, but the matches tended to suffer because they squeezed in a total of five matches within the hour. It seemed to me throughout the hour that they were trying to cram two hours of content into a one hour show all trying to lead up to Best In The World in June. However I don't see the need to do this because we just entered April and June is two months away. Still, this show wasn't bad, I just prefer less matches that are given more time to develop. Instead, we got five matches with only the main event getting adequate time and the rest of the time was used for storyline progression. We will see where things go within the coming weeks, but I hope this trend doesn't continue. Overall Thoughts: This show wasn't bad, but it wasn't one of my favorites. If you only watch one match from this show, make sure to watch the main event but in all honesty you can probably skip the rest. That however, will do it for me and another one of my weekly ROH TV reviews for EyesOnTheRing.com. I hope you enjoy these reviews that have become a staple of Eyes On The Ring ever since it was launched back in July of 2014. If you have any feedback don't hesitate to let me know. In closing, be sure to follow me on Twitter @Headliner5 and be sure to follow the official Eyes On The Ring account @EyesOnTheRing. Also make sure to check out EyesOnTheRing.com for more reviews like this one from myself, as well as the other great content that the entire EOTR team provides you. 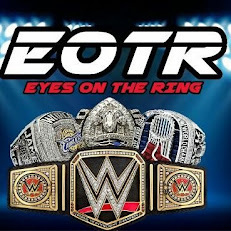 Last but not least be sure to check out Eyes On The Ring radio as we return to our normal time of 11:00PM EST as we bring you the entire week in wrestling from RAW and Smackdown to everything else that there was to talk about. Finally, don't forget to like us on facebook at Facebook.com/EyesOnTheRing. For now, I am Nathan saying so long and until next time ringers, keep your Eyes On The Ring.